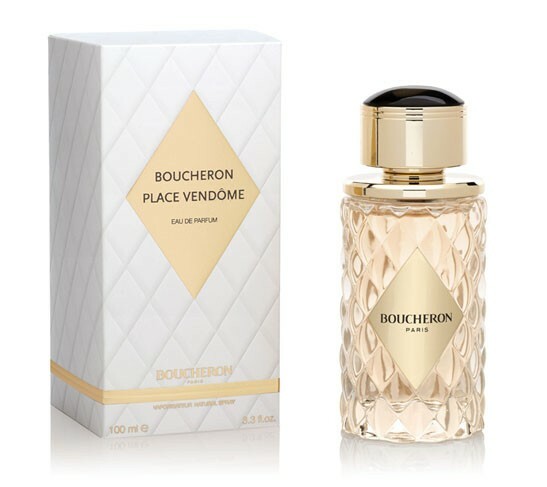 Boucheron presents a new women's fragrance named after Place Vendome, the address in Paris (Place Vendome 26) where Frederic Boucheron opened his first jewelry store in 1893. The perfume symbolizes over 150 years of light and gems that have passed through this house. A woman who wears Boucheron is conceived as independent, free, self-reliant and confident. "A story rather than a face. A story of light. While Paris continues to dream, the sun’s rays slide over the rooftops. The dome of the Invalides becomes a gigantic gold flower. The sun continues to rise, its rays crossing the arcades. Shadows slip from the Vendôme Column, which points majestically at number 26. In a white light, she appears. She is the heroine. On her skin, ephemeral finery to enhance the glow found deep within each woman. Boucheron Place Vendome.” The composition is florinental-woody, created by Olivier Cresp and Nathalie Lorson. It opens with fresh and sparkling pink pepper which illuminates delicate orange blossom and rose essence. Jasmine petals develop in their full floral potential in the heart of the perfume, together with peony enriched with golden traces of creamy honey. The base notes include elegant cedar and sensual benzoin. It is recommended for evening wear.